A couple of weeks ago I wrote about how I came to visit the Sendang Gila waterfall in Lombok’s north. The waterfall as well as another waterfall called Air Terjun Tiu Kelep are located in the Mt. Rinjani National Park, a beautiful area renown for its unspoilt beauty and the groups of monkeys living in the woods. As it turns out, the waterfalls were not far from a Traditional Village named Senaru, sort of like a living museum or open-air museum that you can visit as part of your hiking adventure as it is right next door to the Rinjani Treking Centre. 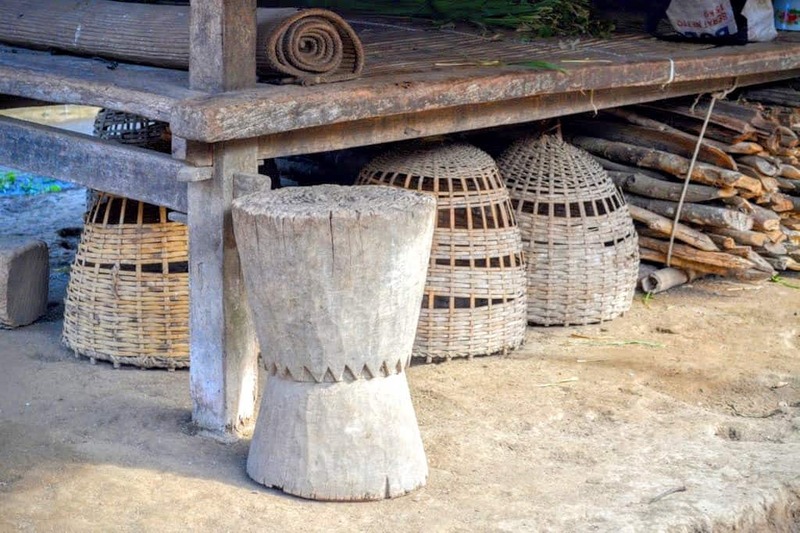 Senaru welcomes visitors to explore the traditional way life on the island, where people still live in houses of woven mats, timber and bamboo, work the rice paddocks and store their crops in stilted wooden granaries that are shared by the whole community. When we visited we had just returned from our trekking adventure which we mastered in torrential tropical rain, hence we were all soaking wet and the roads were covered in big muddy puddles. Yet, by the time that we had arrived at the village the sun had come out again and life had returned to its normal village routine. The people at Senaru village were busy with their everyday chores such as cooking, taking the cow for a walk, showing visitors like us around. Little boys were playing in the common, some ancient game of a wooden gyroscope which they skilfully send rotating with a long threat. It was really admirable how much fun these little guys had with these basic toys – our creatively challenged kids should really take note. Chickens were hopping around, dogs were sleeping on the porches, the trees around the village were heavy with fruit: avocado and bitternut and coconut. 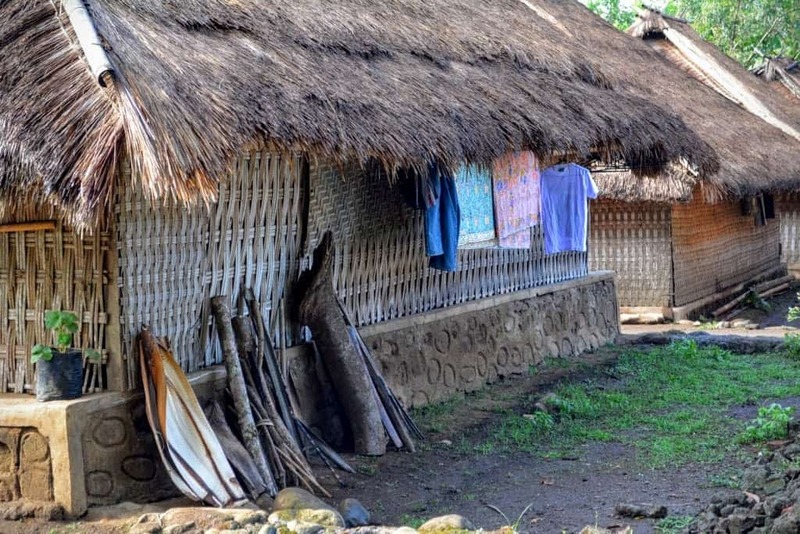 While our group felt that everything looked a bit staged or set up, people did seem to live here in these traditional houses and make a living from the fields surrounding the village. I am sure they would have been more than happy to perform for us some traditional music and dance if requested. 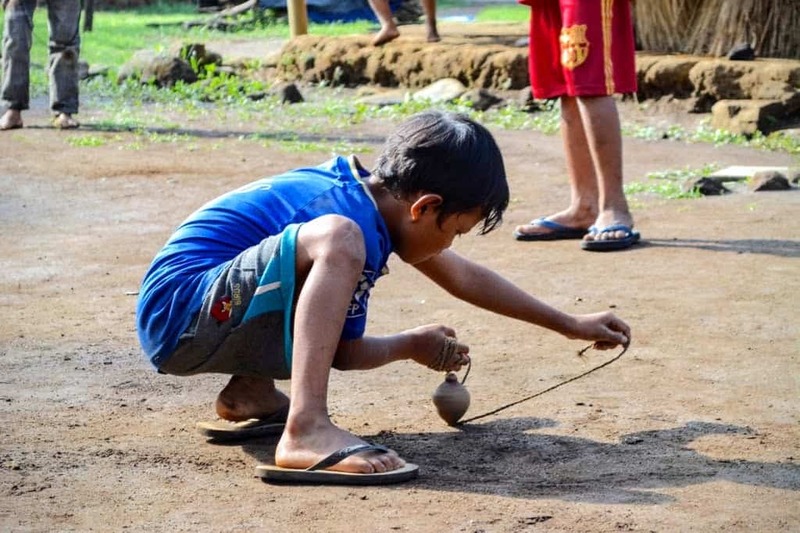 Apparently, you can also ask to chew a betel nut with one of the villagers – donations for guided tours, performances and experiences are always welcome. The village is small, not much more than a handful of houses, standing close together, with just a scooter parked here and there but no cars. In central areas there were shared buildings that were used by all villagers to collect garbage or store rice or similar communal tasks. This was not a trip back in time as such: modern contraptions were not entirely missing, but the way Senaru was build was still very much like in the olden days. Highlight of the visit was a look inside one of the villager’s houses. Out of respect and because of the darkness I chose not to take photographs inside the house but I will try to describe to you what we found inside: the house had a square floor plan and consisted of one room only that the family shared with their young child. I remember there was a wardrobe there for clothes, and a big bed and an open-hearth. The owner of the house explained to us that the smoke produced by the cooking fire helped protect the timber that the house was built from. In the other corner there was a raised platform which was the storage space for a collection of pots and pans and other utensils, by no means traditional but still fitting very well into this hut. Centrepiece of the house and highlight of the experience, however, was a raised platform in the middle of the house, surrounded by walls and really just like a little house within a house. Access was via a ladder, but we did not actually get to look inside this room. The house owner explained to us that this was a place of worship to honour the ancestors – what an unexpected find! 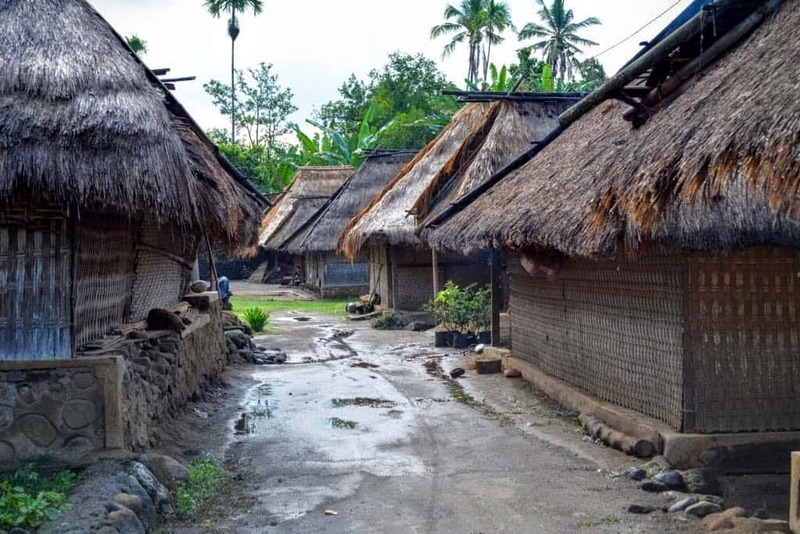 We didn’t spend a lot of time at Senaru Traditional Village, yet it did offer us some rare insights into the traditional lifestyle of the people of Lombok. If you do plan a trip up north to do some hiking around Mt. Rinjani and to the waterfalls (read all about in my earlier post here! ), make sure you also check out the village nearby. Apparently, a guesthouse has just been completed – pictured below -, so you may even be able to stay here overnight.